Betty M. Weigel, 94, Auburndale, died Saturday, March 23, 2019, at Cedar Ridge Elder Services, Mosinee. She was born Nov. 8, 1924, in Wisconsin Rapids, the daughter of the late Anton and Nellie (Dake) Pelot. She married Alois Weigel on April 18, 1960, at St. Paul Catholic Church, Mosinee. He preceded her in death on Oct. 2, 1998. Betty enjoyed doing word search puzzles, putting puzzles together, doing outside work, planting gardens, mowing lawn with a push mower and going out to eat. In her younger years she liked riding motorcycle with Nancy Trachte. She also loved her dogs, Daisy and Nina. Survivors include her daughters, Cara Weigel, Auburndale, and Marcella Weigel, Green Bay; two grandchildren, Dustin ad Jeremy Weigel; six great-grandchildren; a brother, Harry Pelot, Mosinee; and her best friend, Donna Bryant. She was preceded in death by a son, Wayne Weigel, two brothers, Harold and Albert, and a sister, Ruth Gunseor. 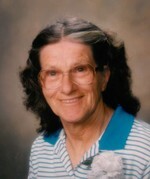 To send flowers to the family of Betty M. Weigel (Pelot), please visit our Heartfelt Sympathies Store.